you can find more in the Afro-Cuban or Senegal section, below left. mi llave el link no esta activo…pruebe…vea y le agradeceria que lo active…….graciaaaaaassssssssss. Ooops, missed a symbol, it should work now..
Last week, I accidentally threw away my webstatistics history. A very stupid thing to do. I now managed to re-install a statistics counter but I had to start counting all the way from zero again, shame..
is there a way to get back my old stats ? who knows ? een klapper moos dat was zeker ook de prijs van de lp!!! Utrecht kennende. Ben niet geweest moest werken helaas. Altijd leuk zeker op vrijdag en zaterdagochtend en lekker ouwehoeren met andere vinyl verslavenden. Very nice! I remember this band was my first meeting with African music. About 15 years ago I lived some months in Groningen. There was a little record store/company there that published this music on CD. Forgot the name .. I was struck by the modest and tranquilizin’ tunes – so much played with passion and soul. Some guys have all the luck .. 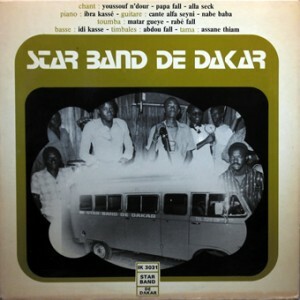 I found this incredible LP this year in senegal… Mine has a stamp on the back: “Discotechnique Kasse – Rue de Reimes x Malick Sy – Dakar” Do you know if this was Ibra Kasse studio? (my LP would be Ibra Kasse own copy?!!!) Do you have info about this? (Moos, may be you have other LPs with such a stamp…). Anyway, i dont really care, it’s really great senegalese music as I love… (senegalese latin rythms… including “Mane Kouma Khole Thiyove” hit). (special bonus: as they are friends sometimes Pape invites for a set Bala Sidibe, ex-Baobab in late 70s). Thanks a lot for this beautiful music. I’ve got the Etolie De Dakar vols 1-4 and this is even better! Fantastic! 20 years ago I bought a copy of this album in a plain paper sleeve (cost me 50p in a well known vinyl exchange). Now I know what the sleeve looks like! Moos, a few days ago I watched he film Xala of Ousmane Sembene, where we can see the Star Band, and we can relive the atmosphere of that time. This album and the film forms a unique combination. Many thanks for this extraordinary gift. Interesting article you got here. I’d like to read something more concerning that theme. The only thing I would like to see on that blog is a few pics of some gizmos. I know im asking for too much, but would any of yous be so kind of letting me know where or from whom could i get the WAV file for the track MISTERIOSO of this amazing and beautiful band from Senegal? Im a good DJ and im preparing a studio album and would love to get my hands on this track so im asking a lot i know, but it would be great if anyone could help. Throw me a rope please! Here in Buenos Aires (Argentina) these albums are not to be seen or found…Help please!!! !